BIRMINGHAM, Ala. -- Severe thunderstorms crawled across the Southeast on Monday, dumping heavy rains and causing flash flooding in central Alabama, where crews in small boats and military trucks had to rescue more than two dozen people from their homes and cars. In Mississippi, a 9-year-old girl was missing and feared swept away in a flash flood after the storm dropped nearly 7 inches of rain over the last two days. A possible tornado damaged homes and hurt seven people in another part of the state. The storms hit Mississippi on Sunday and spread overnight into Alabama and Georgia. Strong winds downed trees, power lines and snarled rush hour commutes. In Pelham, just south of Birmingham, more than 4 inches of rain fell from 7 p.m. Sunday to 7 a.m. Monday. Police and firefighters rescued people who became trapped in townhomes and a mobile home park that flooded because of a nearby swollen creek. 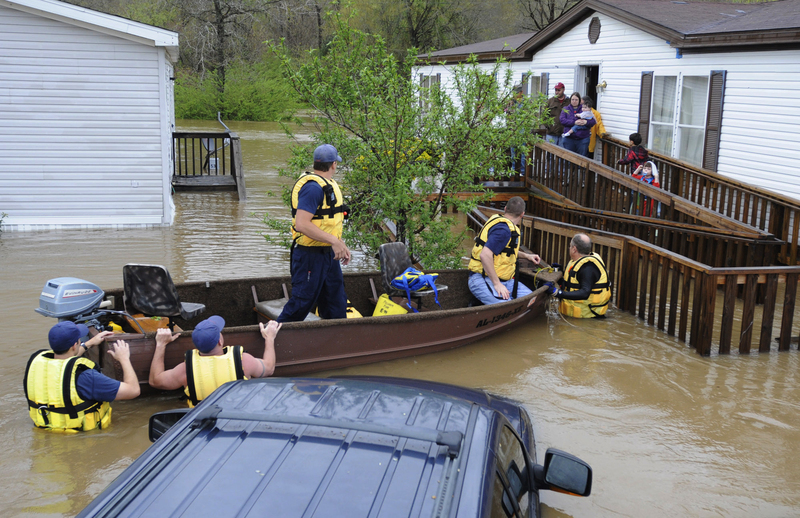 Dozens of cars had water up to their roofs, and fast-moving water rushed by the bottoms of the mobile homes. Rescue workers wearing life jackets waded through muddy water nearly to their chests to reach stranded residents. Hundreds of more people in mobile homes on higher ground were isolated because water covered the only entrance to the complex. Street signs stuck out of the high water. At an apartment complex in the suburb of Homewood, rescue crews used a boat to help several residents and pets get out of flooded first-floor units. Ken Atkinson with Homewood Police told CBS42 in Birmingham that the evacuated residents were being transported to a city gym rec center, but they were looking for a more permanent place to set up a shelter. At a stairway tread company in Pelham, about a foot of water overflowing from Buck Creek filled the inside of the small factory and swept across the American Safety Tread parking lot. Worker Terry Browning said about 50 people would normally be working. "They are getting all the power cut off, and then we'll all go home, I guess," he said. Some roads in Birmingham became impassable, and schools delayed opening in many areas of central Alabama due to the heavy rains. In Augusta, Ga., where the Master's golf tournament is being held this week at Augusta National, practice round play was temporarily suspended Monday because of severe weather. Alabama Power Co., the state's largest electric utility, reported 11,000 homes and businesses without power, with 6,200 in the Birmingham area. In Mississippi, a 9-year-old girl was last seen playing in floodwater near her parents' house around 7 p.m. Sunday in Yazoo City, the Delta region northwest of Jackson. Search crews and volunteers looked for her in drainage ditches and other areas where water remained, police Maj. Tilmon Clifton told broadcaster WLBT-TV. Farther south, a possible tornado damaged homes in Covington County, where seven minor injuries were reported, the Emergency Management Agency said. Wind damage was reported elsewhere. In metro Atlanta, heavy rains slowed cars on the interstates and traffic lights were knocked out. Rain was expected to continue for much of Monday and flood warnings were in effect across the region. The National Weather Service also warned people that more tornadoes and severe thunderstorms were possible.